This post is a couple of months late, but better late than never. 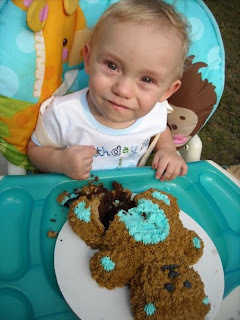 A few months ago, a little boy named Joshua turned 1. Being a very exciting time for the parents, they decided to throw a teddy bear party and asked me to make the cake. One parent wanted chocolate cake and the other wanted vanilla, so we compromised. The bottom tier was a vanilla cake with vanilla frosting and fondant. The teddy bear was made out of dark chocolate cake with chocolate filling and piped in chocolate frosting. The extra cupcakes were all out of chocolate cake also. Of course the Birthday Boy had have his own "smash cake" so he could make as big of a mess as he wanted. The family said that he treated the bear with the utmost respect before devouring it. I don't know about you, but I think he's pretty adorable. i still dream of the cake. it tasted so good! I've already started planning his second birthday around the cake! :) ps: i think he's adorable, too!